The Klamath Basin area is home to multiple National Wildlife Refuges (six of them! ), and is a major stop-off for migrating water fowl along the Pacific Flyway during the autumn and spring. This flat high desert area (around 4000 feet elevation) straddles the border of Oregon and California and is just east of the Cascade mountain range. It is also host to a lot of agriculture, using waters diverted from the Klamath River to irrigate fields. The Basin sits in view of several volcanoes that are part of the Cascade range, and the area is of volcanic origins. It is truly a magical landscape. Recently it has become even more exciting as there are now two small wolf packs that call the Cascades just west of the Basin home (one of which is the famous OR-7 wolf, who at one point traveled to California and became the first confirmed wolf in CA since the 1930’s)! snowy pass through the Cascades! The wetlands themselves are estimated to be only 25% of what they once were, due to appropriation of land and water to agriculture. Many interests share this region, and it is often the subject of debate on how to best share the resources among all them, including Wildlife/Plants, Indigenous People, agriculture, hunters, birders, fishing folks, etc. During the winter months, there is a very high population of raptors that migrate here to wait out the winter due to the availability of prey (and it should be noted that agriculture fields that are dormant often provide a home to many rodents, thereby attracting more raptors). 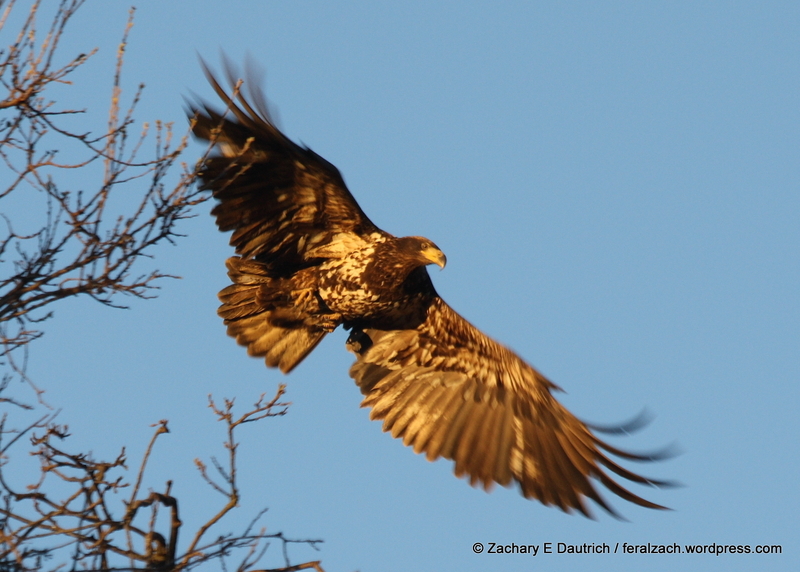 Here during the winter can be found the highest density population of bald eagles in the continental U.S. outside of Alaska! 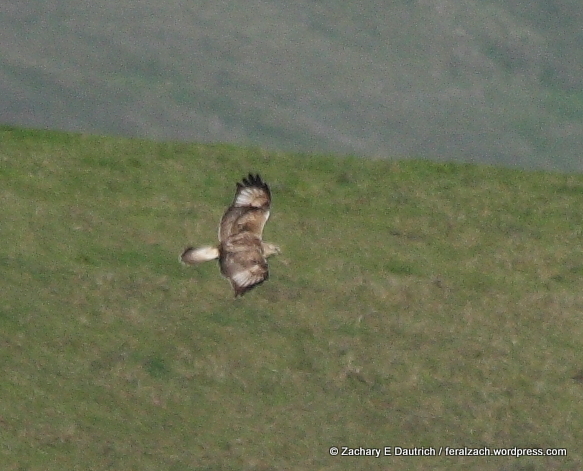 I have been there previously and seen around 50 eagles in one 360 degree view! 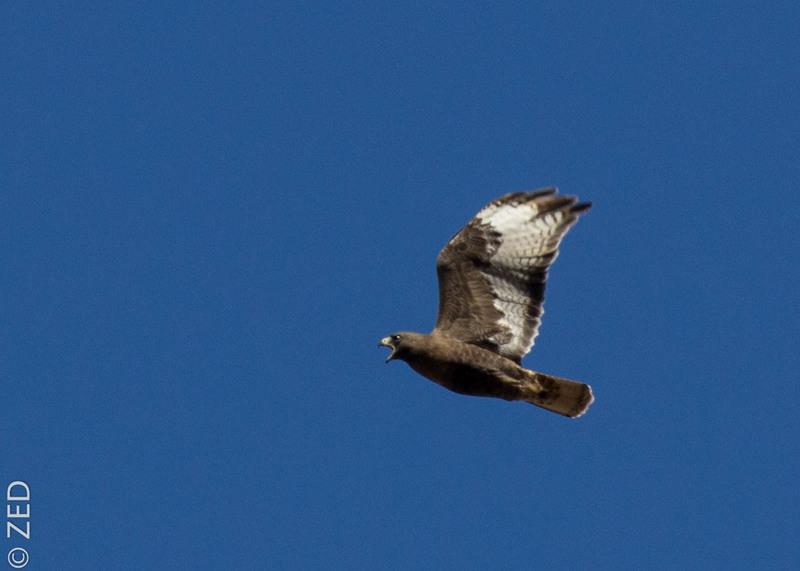 Not only that, there are a lot of northern migrants such as rough-legged hawks and ferruginous hawks, species not often seen this far west or south. 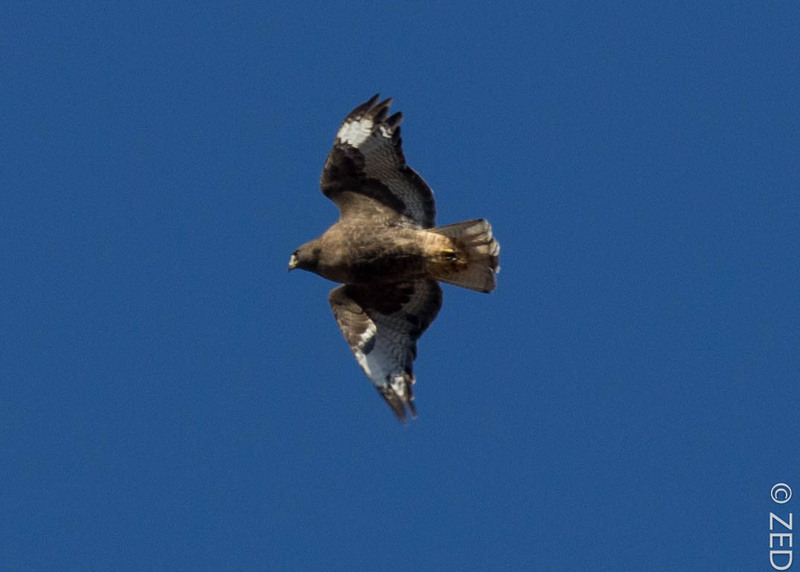 Those in addition to golden eagles, red-tailed hawks, northern harriers, assorted falcons, many owls and more can be seen here. I braved some cold temperatures, especially the first day – it was near 0 deg F. A ranger I spoke to said that in the morning he had seen a northern pintail (type of duck) that came out of some reeds and couldn’t get its wings to extend – they had frozen to its body during the night! That’s cold (it eventually did free its wings). Needless to say there weren’t many people out there besides me, but I was able to see some amazing sites and sights (which I’ll highlight over the next few blog posts). My final picture of the first day is a great summary of the area. The sun had set over a half hour before I took this picture – I saw these birds sitting in a tree as I was driving out. My old jeep was not doing a great job of keeping the cold out, but despite my numb fingers and toes I got out to snap this shot. As you can see, the area does not have many trees, so they are coveted by many different birds. Because of the density of prey and lack of trees, often I see multiple species sharing a tree or telephone pole – a necessary truce. The large forms in the tree are a bald eagle on the left, and a red-tailed hawk on the right! They are buddies! 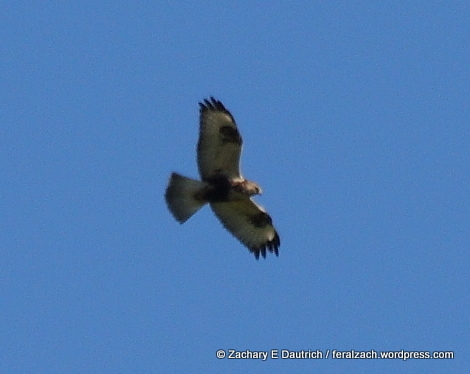 At least for the night (usually I see red-tails chasing and harassing bald eagles). Sprinkled among mostly the tree on the left are many red-winged blackbirds as well. This February weekend (this year it is Feb 11-14 2016) focuses on raptors in the Klamath Basin area and attracts many people to the area. Tours and guides are available, as well as many other events. Definitely worthwhile!!! Lava Beds National Monument is nearby, and Mount Shasta is not far to the south. The whole area is really magical, any time of year. What an absolutely amazing place – the Oregon / Cali border, specifically the Klamath Basin area. I did my own version of a takeover of a National Wildlife Refuge in Oregon the past two days, but it was all peaceful, and I think much more exciting. 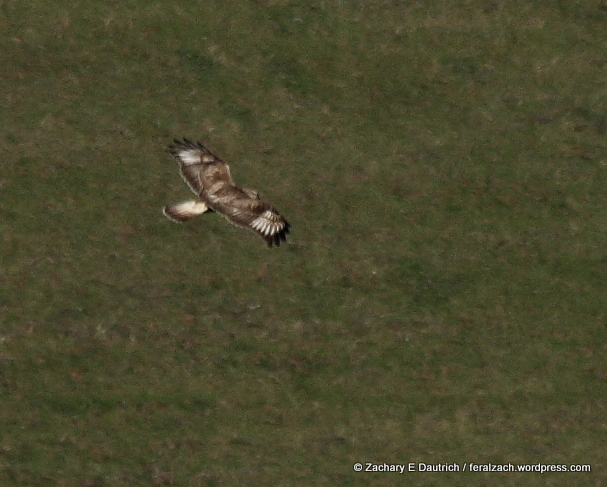 The quantity and diversity of raptors found in this one area during the winter is astounding! 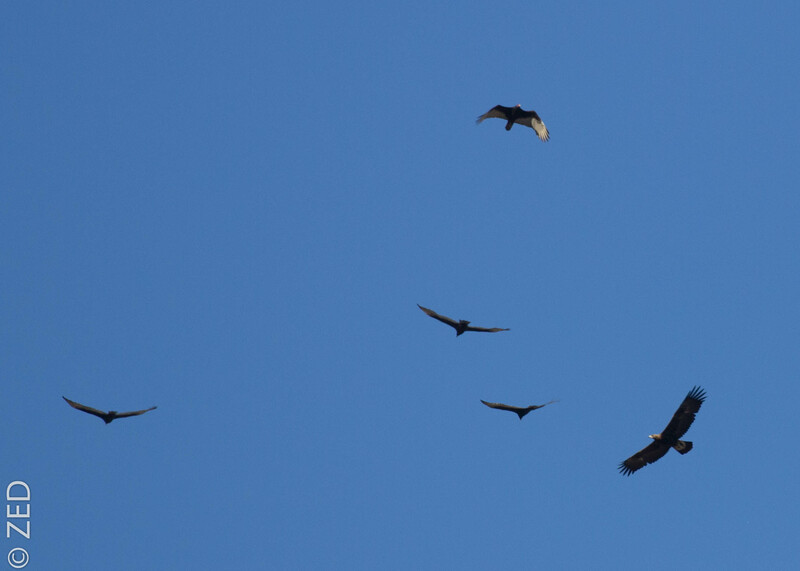 I was driving down a road in Sonoma County today and noticed a large kettle of turkey vultures flying above an agricultural area – probably numbering almost 40 birds! It was somewhat unusual, and certainly not something I’ve seen yet this year. 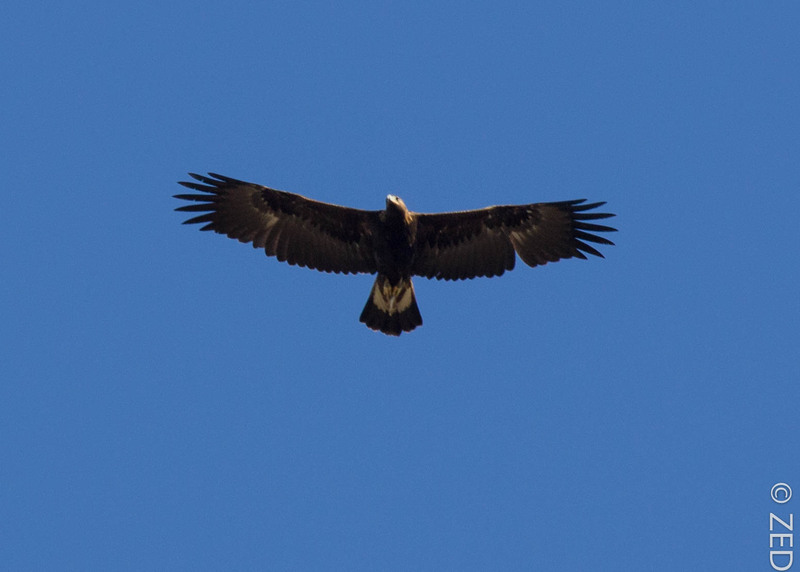 I pulled over to take another look, knowing that often golden eagles will “hitch” a ride along with a group of vultures. 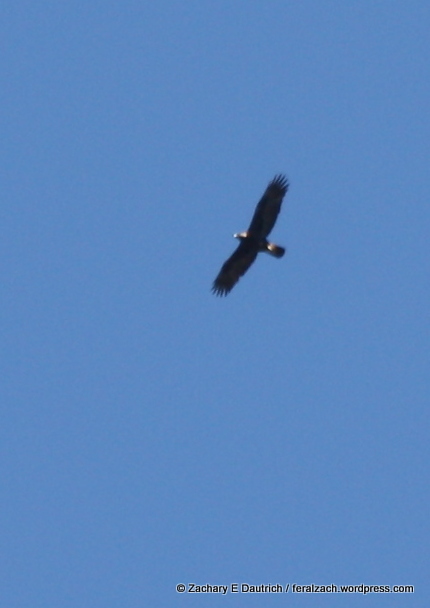 As I was counting the vultures, boom! I followed the kettle, which conveniently for me also was following the road in my direction! I made a number of stops as I followed it, and during my final stop the Eagle was kind enough to turn around and do a fly-over for me. 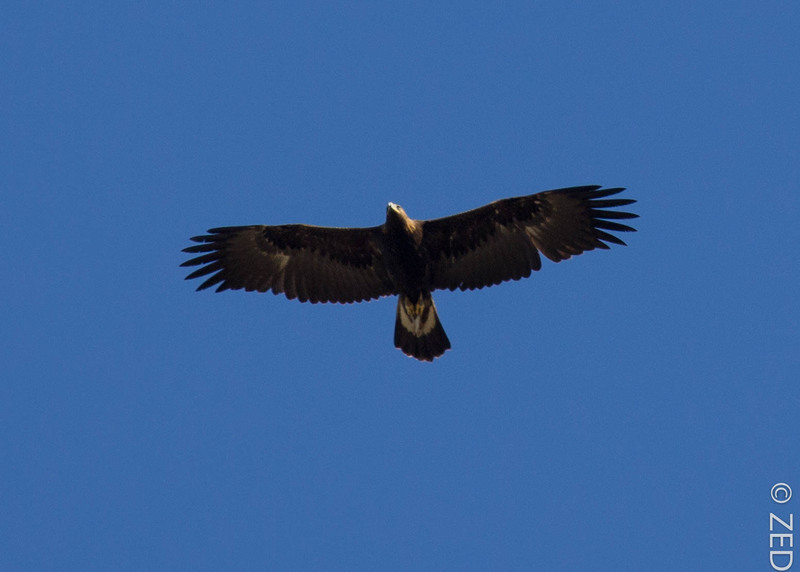 Such a beautiful bird – as I observed it I noticed that it lacked any under-wing white patches, but its uniform feather coloring and uniform-length flight feathers indicated that it was probably a first-year hatch bird. It appears it has lost one of its left secondary feathers, which initially made me think perhaps it was older and undergoing a molt, but I still think this bird is a hatch year bird (meaning it hatched this spring). 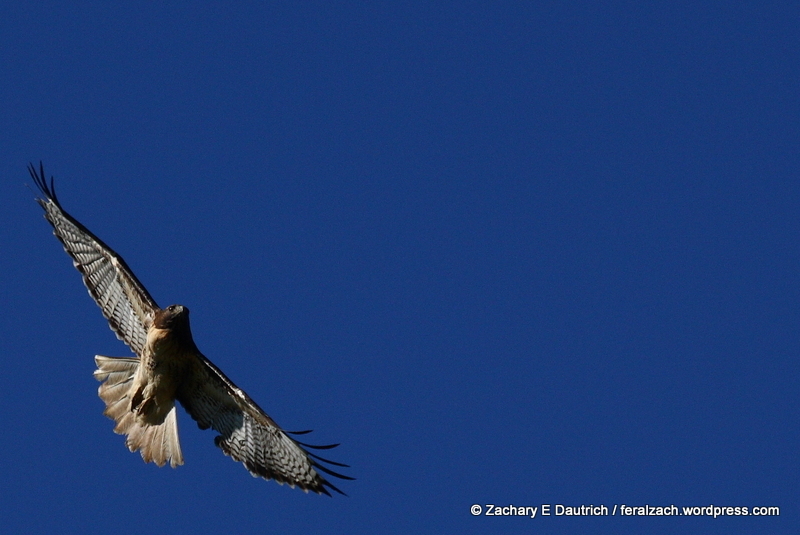 The Red-Tail launched into the kettle and did a few dives at the Eagle, but they were half-hearted attempts – more bark than bite. 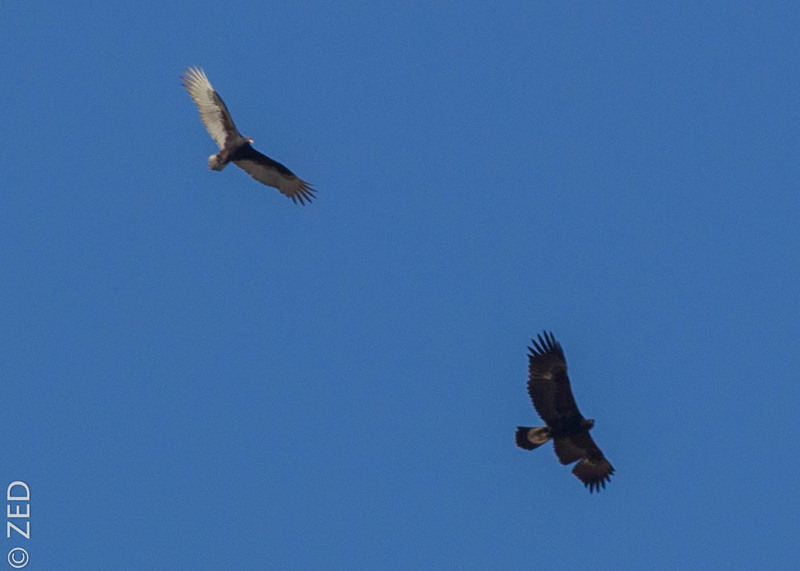 The kettle of vultures, with the Eagle still flying in it, slowly floated away from the Red-Tail’s territory as it retreated back to a perch in the trees. 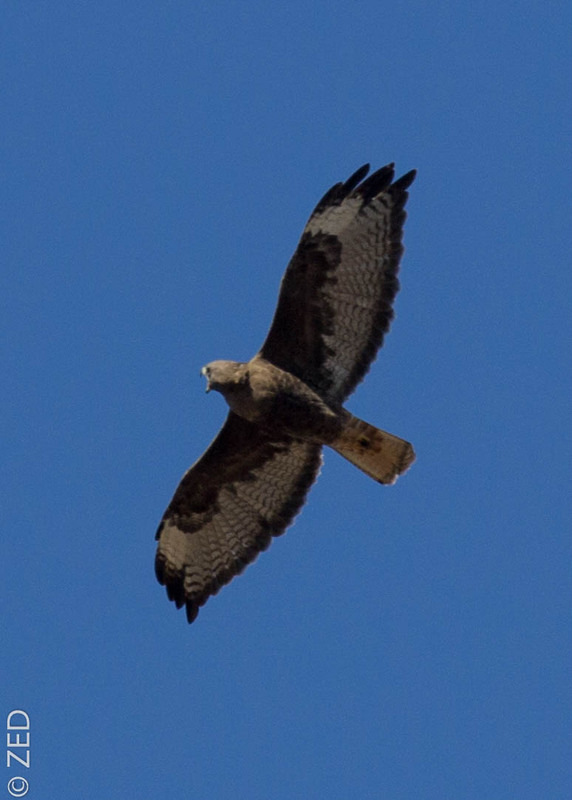 Here in the West, especially towards the coast it seems, we have more frequent occurrence of “dark morph” Red-Tails (they have a very diverse variety of feather patterns and tones), and often I’ve seen people mistake these birds for Eagles. To the untrained eye, this is totally understandable. But when you see the two together, there is little doubt about the ID. 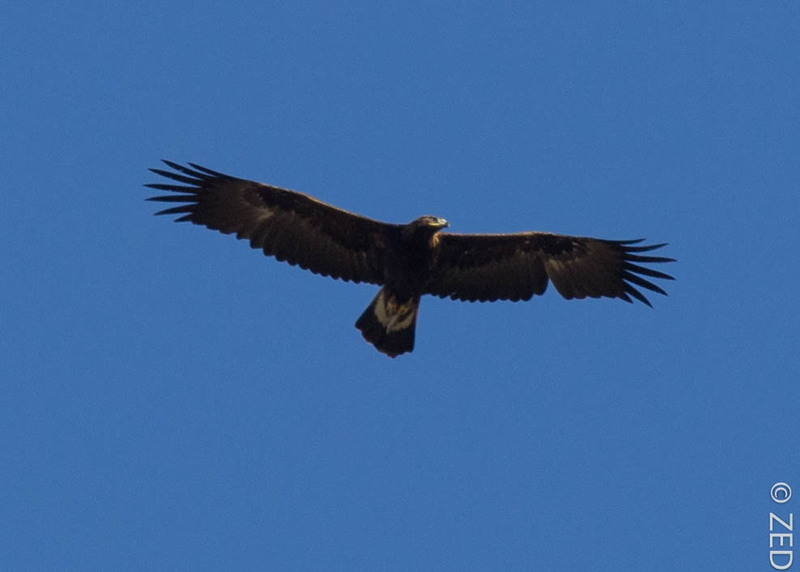 Golden Eagles are quite a bit larger, have distinctly different plumage when observed closely, different wing shapes, and different shapes/silhouettes when viewed from below. Turkey Vultures are only slightly smaller than Eagles, and both can hold their wings in a slight dihedral shape when soaring – to the naked eye they can appear very similar – but upon viewing them with binoculars, they also have very different silhouettes and feather colors, and an experienced observer can distinguish the two from each other even without binoculars. 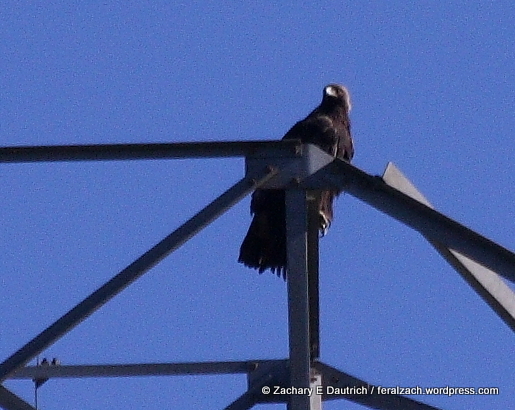 It was really fun to see all the Vultures, the Eagle and the dark Red-Tail on this beautiful NorCal “summer” day. I had the good fortune to go for an adventure yesterday with a friend to practice trailing animals – the species of focus was the feral pig (feral hog). The weather was outstanding, despite some strong winds early in the day. It doesn’t get much nicer here than these sunny days with clear blue skies and temps in the 70’s – and the light was great too. 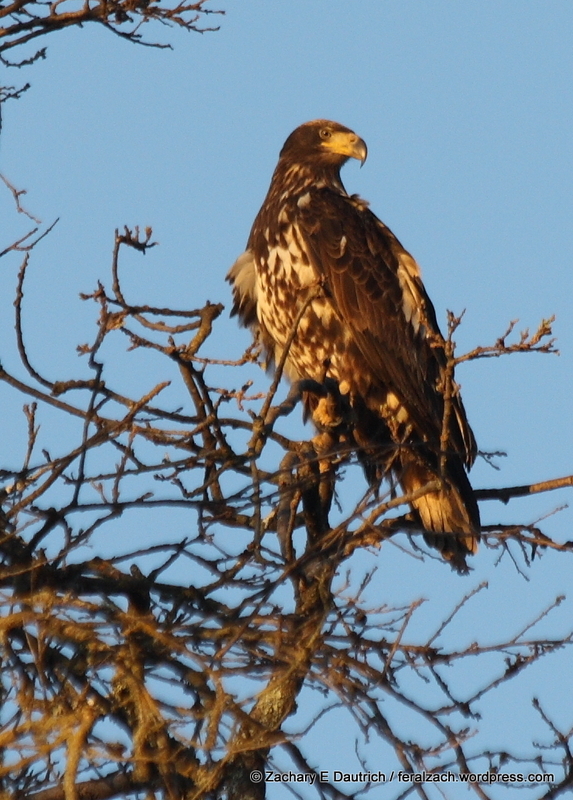 I knew it was going to be a good day when not long after sunrise I saw a juvenile bald eagle (hatch year / 1st year) perched in a tree overlooking a creek. 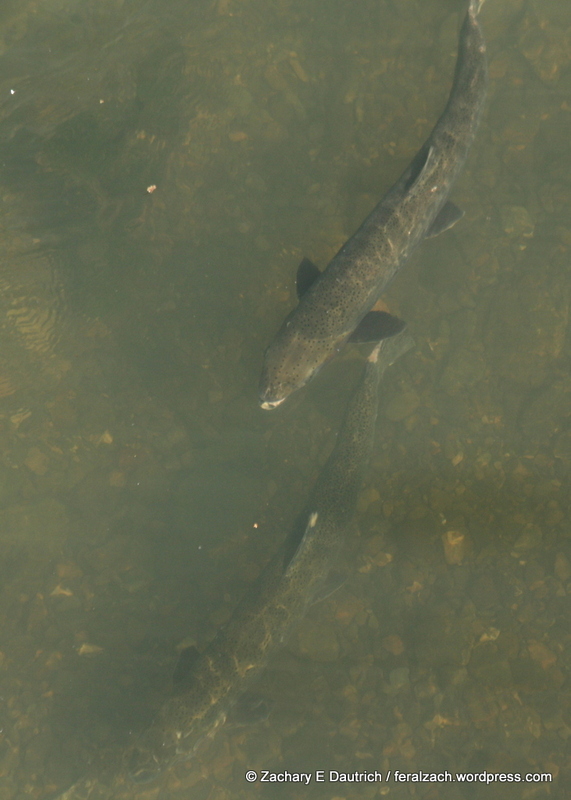 It was eyeing up some water fowl and steelhead, the latter of which were spawning in the creek bed below. Steelhead are a type of salmon, and once were found in great numbers up and down the west coast. As with many of the salmon, their populations have been suffering due to over-fishing, habitat loss, and pollution. 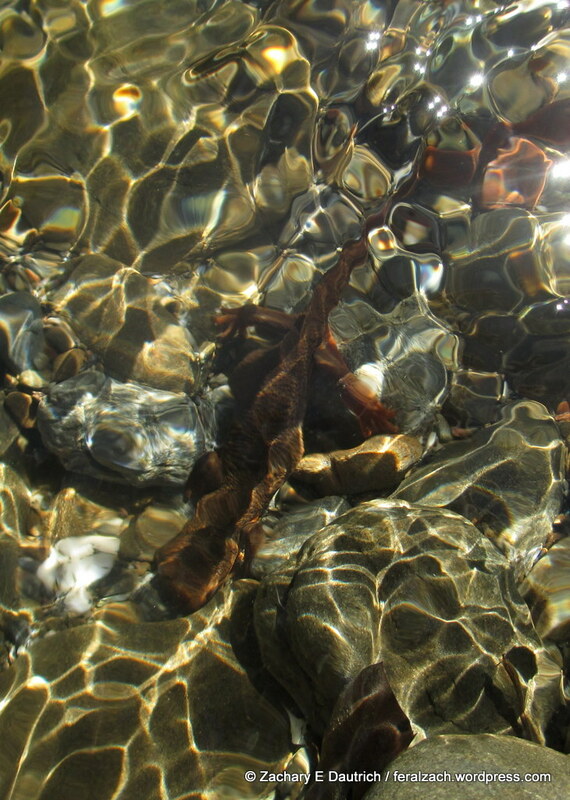 This time of year, mature fish swim from the ocean back into small creeks and streams from where they were born, where they create nests in the creek beds to lay their eggs. Unlike other salmon who die after spawing, some steelhead return to the ocean for another go. Interestingly, according to current science taxonomy, they are the same species as rainbow trout – the difference being that steelhead are anadromous, meaning they spend part of their life in the ocean. Because of this, they look physically different than fresh water rainbow trout (larger). These fish shown below were probably close to three feet long! I was on my way to a remote area of western Sonoma County where we were going to do our wander, on some land miles from any roads by the Gualala River. I feel like Sonoma County is my “second childhood home” – and it felt so good to be visiting on this beautiful spring day. Feral pigs, also called feral hogs, are non-native animals whose relatives escaped from the domestic life and have secured a place for themselves and their progeny in the wild. 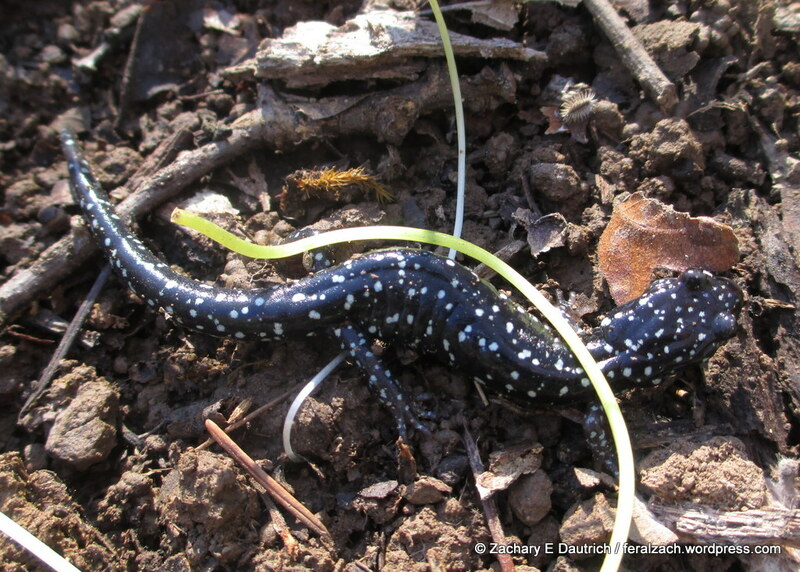 Sonoma County has a large population of them, and many areas of the country consider them to be a pest. They certainly don’t tread lightly on a landscape – in areas of high density, the ground can be torn up all over the place from their rooting. 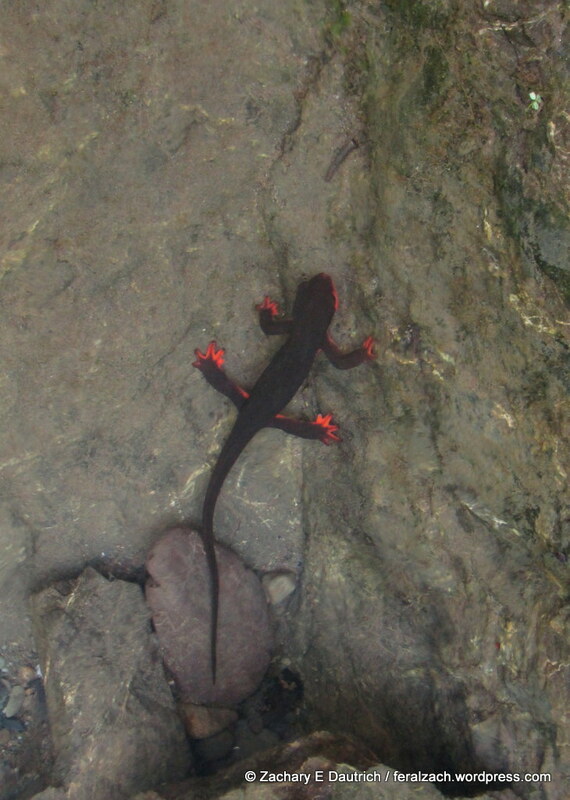 They are an amazing animal – highly intelligent, very social, and incredibly adaptable. They can also get pretty big – some of the larger boars are around 300 pounds! And they can be pretty intimidating to see – large tusks, coarse hair covering parts of their body – they often don’t look like their barn-yard cousins. I have mixed feelings about the native / non-native debate. The truth is that many of our ecosystems are so different than they were prior to European colonization – especially with the removal of so many of the apex predators – that it is unlikely they will ever be the same. Especially without reintroduction of the trees, plants and animals that were originally here and created a balanced web of life. You don’t grow old-growth redwood trees overnight. I imagine the pigs would not be as successful if there were wolves and grizzly bears around (as there once were in this area) – but I bet the main detractors of the hogs would be even less apt to welcome that strategy! There is a difference for humans, psychologically, when labeling an animal as a pest and/or a non-native – somehow it’s life seems to be valued less. I have an issue with this. These are still living, breathing creatures, just doing what we all are doing here – trying to make a living. I’m not suggesting that all non-native animals should just run amok with no management plan in place, but I do believe there can be better, more compassionate management strategies that are also more supported by science. Ones that honor these animals as individual living beings, with a value the same as any other living being. Sadly, humans have used (and continue to use) this type of labeling to denigrate people too – whole cultures, races, and people of varying lifestyles have been subjected to horrible treatment because of this manipulative psychology of labeling. It was fun to get to be in the world of the hogs for the morning! We started off by looking for some fresh tracks so that we could have a chance at being able to trail and find the animal that laid them. The pig sign was everywhere – the trick was finding something fresh. Despite some of the recent rains, the ground in some areas was already becoming quite dry again, so it wasn’t holding sign as well as it had been just a week ago. We ended up on several different hog trails, the first of which took us down a steep hill side, traversing downward through the trees. 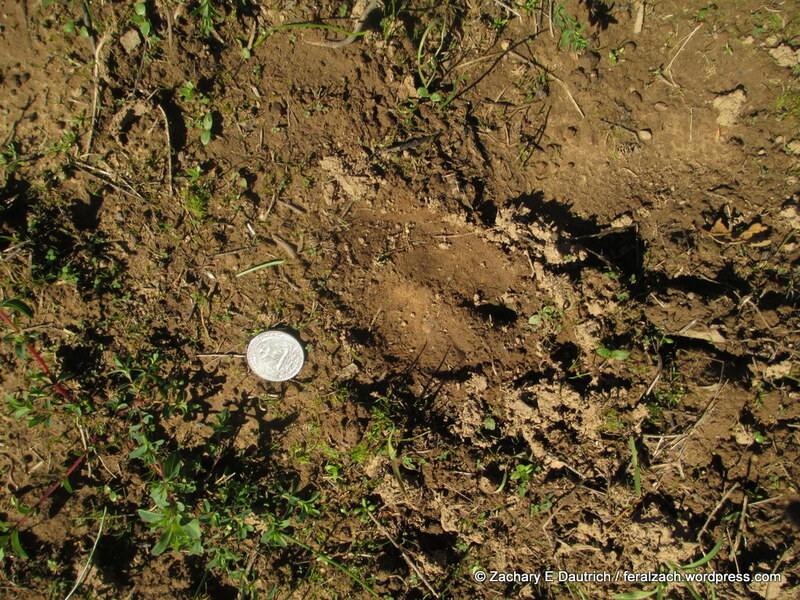 We saw quite a few pig beds – all empty – strategically situated at the base of large trees on a steep slope, with crunchy leaves all around that would belie the presence of an approaching predator (or tracker!) and allow for multiple escape routes. After being on it for quite a distance, eventually we lost the trail – which seemed impossible, given we were following a number of individuals travelling together. How do 150 to 300 pound animals seem to vanish and leave no discernible sign? Perhaps there is a “pig vortex,” similar to the “raptor vortex” – the place raptors seem to often disappear to, out of the air, when you take your eye off them for a second! Amazing! Humbling. We continued on, looking for another trail to follow, and eventually we found some more fresh sign just off the dirt access road we were following. After poking around a bit, we took a hog trail down another steep slope descending 100’s of vertical feet. There were some fairly fresh tracks on it, but mostly we were just curious where they were going as it seemed to be a highly used trail. 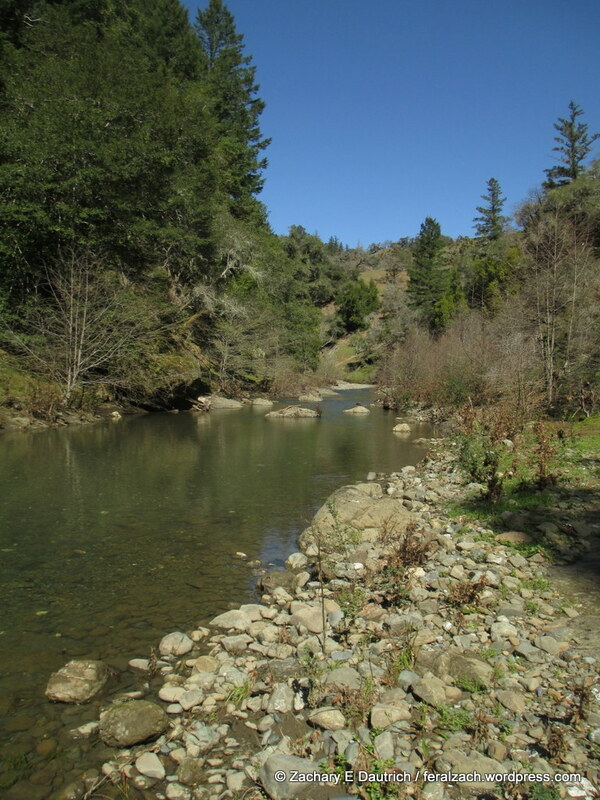 It took us all the way down to the bottom of the valley – and to the Gualala River. I could have spent days at that spot. The river was gently flowing past, its gray-green waters moving over small round river stones on its bed. Small waterfalls and seeps were cascading into the river from the steep hillsides, scouring the rocks and making a home for glowing moss and lichens. 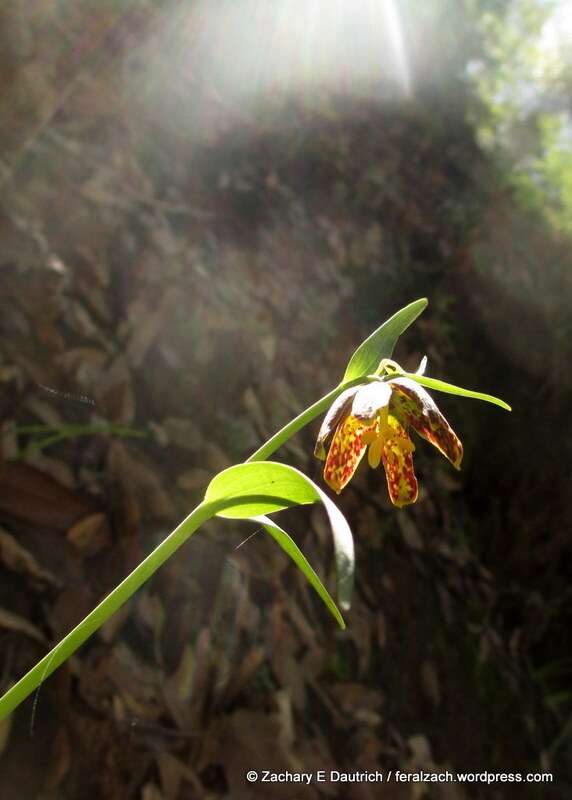 An abundance of life, and signs of animals passing through, was everywhere. I was overwhelmed by the calm and beauty. 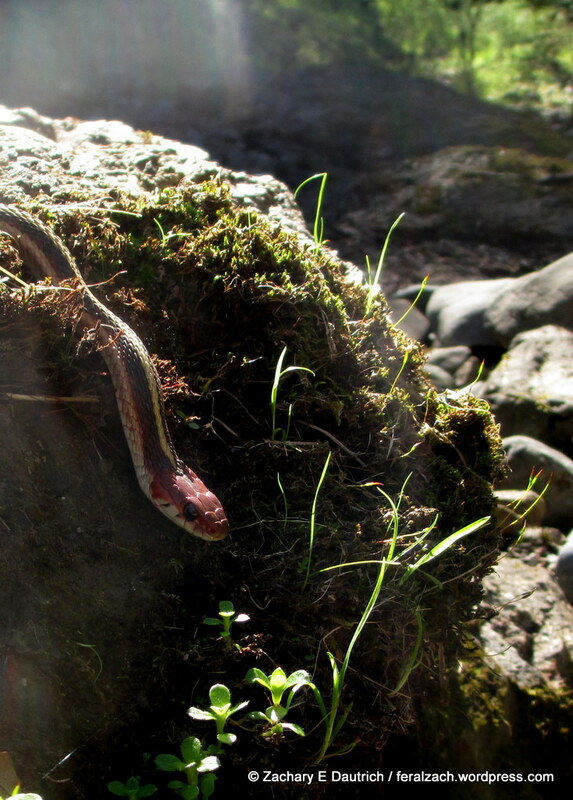 Once I made my way back to shore, we saw a little snake sunning itself on a rock ledge. All the animals seemed to be in the same blissful, relaxed state that I was in … under the spell of the Gualala River and the warm sun above. 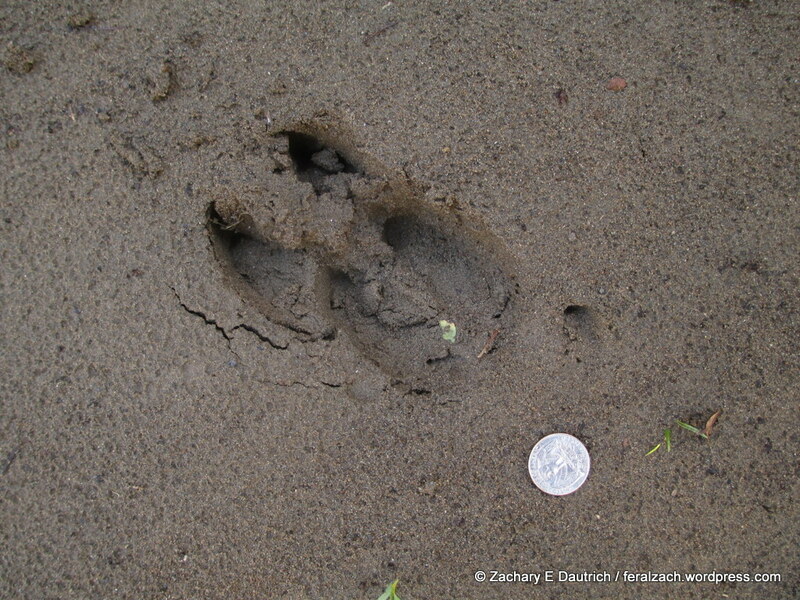 Finally, we hit upon some nice fresh hog tracks in the soft sediment on the banks of the river. Back on it! These were likely from a pretty big boar. We followed him back up the hillside from where we came, but once again after a little while we lost the trail. Humbling! 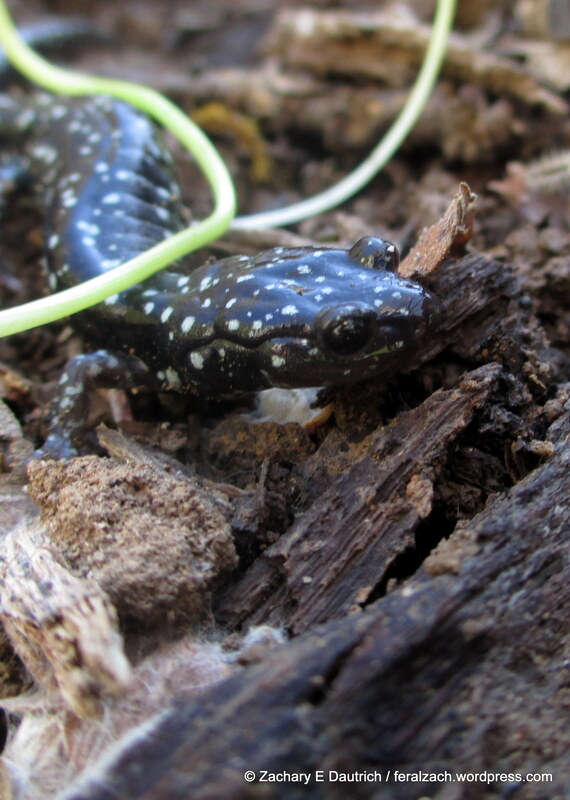 As we fanned out and attempted to pick it back up again, we found another little creature on the hillside under a log that we had disturbed. We put a new rock and some leaves back over this young lady to keep her out of the sun after we left. 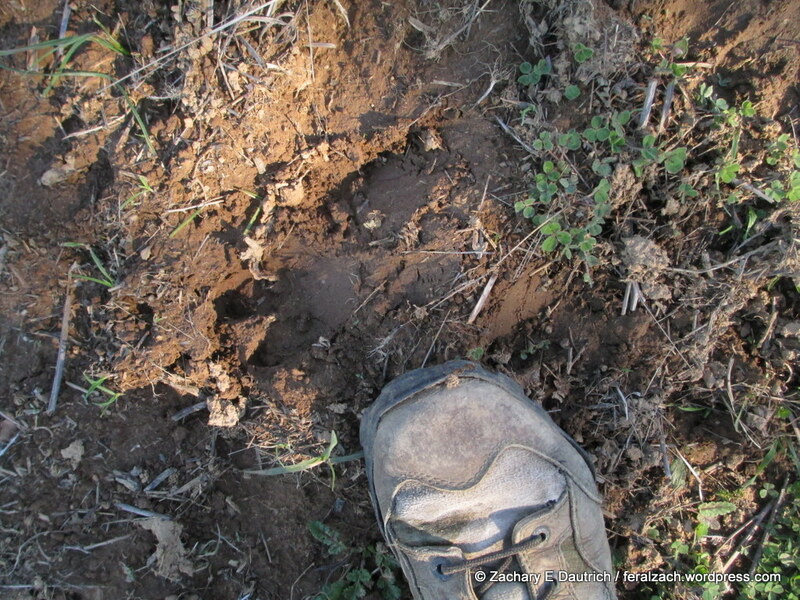 As we got to the top of the hill, we found the boar tracks again … and it was one of the tracks that we had originally seen when we started on this trail! We had come full circle. 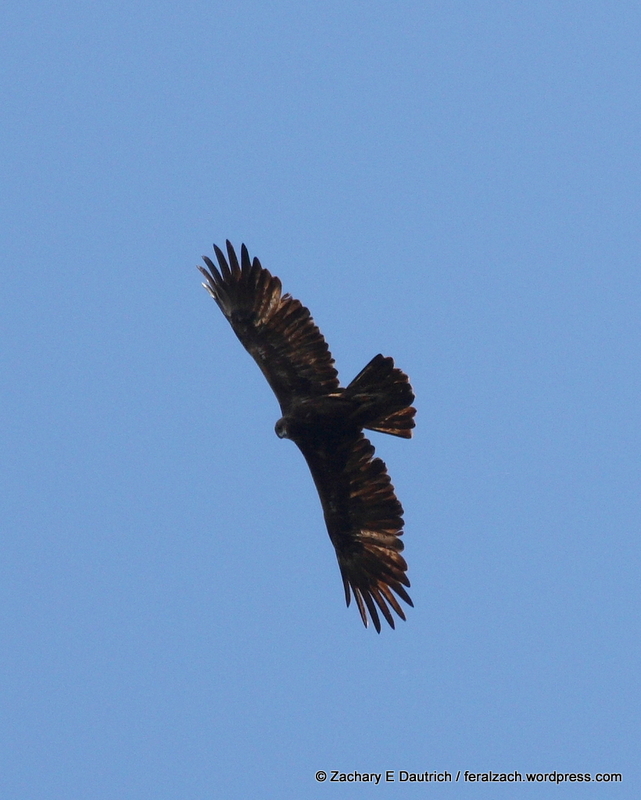 We reluctantly made our way out of the property, but as we were leaving we spotted one last treat – a golden eagle! it was a double eagle day. A good sign and a perfect ending to a great morning. I am so thankful to have gotten to spend the day out there, many thanks to my friend Matt for taking time to share this special place with me. * As a side-note, in recent times vineyard owners have been trying to push into some of these areas because they are ideal for certain grape varietals, such as the popular pinot noir. 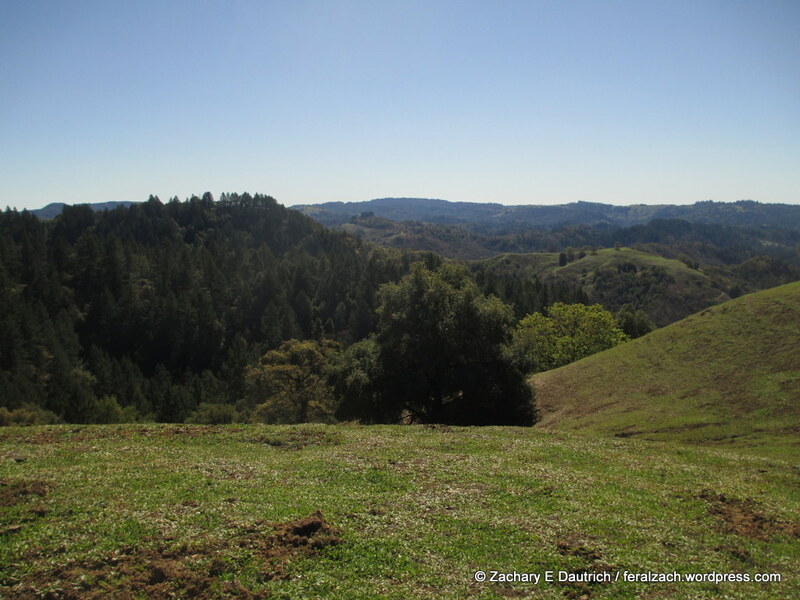 Thankfully there are many organizations, including Native groups, that are spearheading the effort to keep this land intact from groups who want to convert forest to vineyards (or other clear-cutting). The amount of life that is impacted by deforestation is astounding, and humans have already destroyed 96% – NINETY SIX PERCENT – of existing redwood ecosystems since the west was “settled” … and old growth constitutes just a small part of that which remains. Scientists have barely scratched the surface of understanding ecology and the web of life on this planet, and it has been shown that the canopies of redwood forests contain a huge amount of biodiversity. Seems like there is a lot of value in honoring these remaining places – and perhaps a duty to do so.